It struck a pier in New York City and survived. It faced early delays and scheduling snafus. But it overcame those problems and was able to thumb its nose at skeptics, serving 73,000 riders in the month of August and making fans of many Torontonians. And then last week, The Breeze suspended service. Its owners, two successful players in the financial world, said The Breeze was hemorrhaging money. The move stunned the public, catching even Mayor Bill Johnson, the Toronto Port Authority, and local tourism leaders by surprise. Officials from Canadian American Transportation Systems, which owns and runs the service, cite one main reason for the service stoppage: CATS' Australian-based financial backer, Export and Finance Insurance Corp., has withheld the $1.5 million in escrow CATS was counting on to get through the fall and winter, when ridership will dip. The move not only forced CATS to suspend service, but the company has laid off the majority of its employees, as well. And EFIC is withholding those funds until several expensive issues are cleared up: $2,500 CATS pays in daily Canadian Customs fees; just over $5,000 in daily pilot fees; post-9/11 restrictions keeping CATS from transporting commercial trucks across Lake Ontario; the lack of a permanent terminal in Toronto; problems transferring the ferry's title. Despite all this, CATS officials are optimistic that they will be able to resume service sooner rather than later. Already, there are positive signs: EFIC representatives are expected to be in Rochester and Toronto this week or next to review CATS' business plan and attempt to resolve the issues holding up the $1.5 million in escrow. 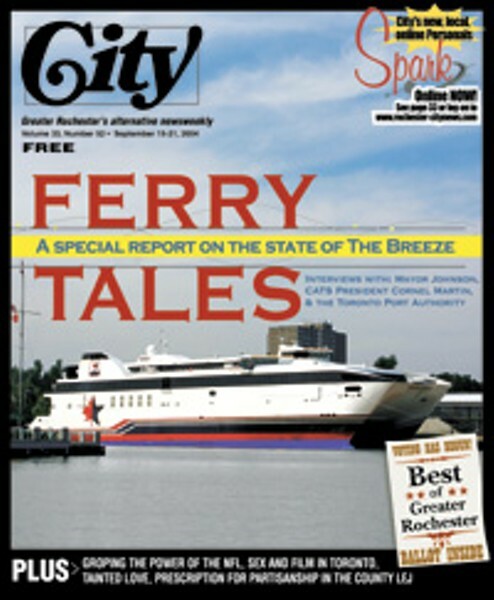 But while Johnson and other community leaders are trying to help solve those issues, and they say they still believe in the viability of the ferry, the sudden suspension of service has hurt CATS' reputation. Some observers are saying that although CATS President Cornel Martin is experienced and CATS owners Dominick Delucia and Brian Prince are successful financial people, Delucia and Prince aren't experienced ferry operators. Questions linger about CATS' ability to do a better job in the future. It's hard to tell if all of CATS' problems are due to CATS' management or to the fact that The Breeze is a complicated new venture. But it's clear the entire process --- from the time The Breeze was put in the water to the day it shut down --- has been fraught with misunderstandings. One example: The Toronto Port Authority and CATS officials disagree strongly on when CATS knew the Toronto terminal would not be complete until January 11. Meanwhile, Toronto Mayor David Miller has been trashing the TPA in the press, blaming it for delaying construction of the terminal, despite the TPA's being forced to pay for the construction of the terminal ($10.5 million Canadian) on its own. In City Newspaper interviews a few days after The Breeze stopped service, Mayor Johnson, Cornel Martin, and TPA Chief of Operations and Engineering Ken Lundy gave their version of the problems leading up to the suspension of The Breeze. Edited versions of those interviews follow. Rochester Mayor Bill Johnson here! Cornel Martin, CATS CEO here! Ken Lundy, Toronto Port Authority here!